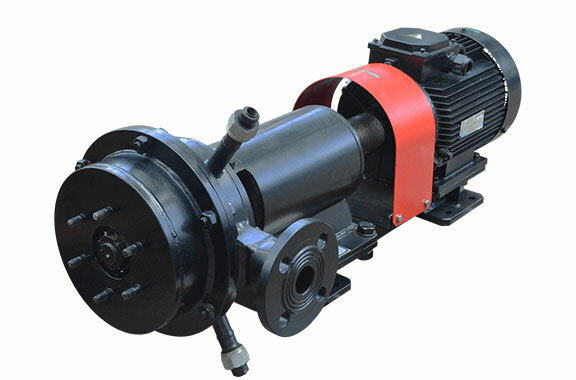 The CLM-4 industrial mixer, is designed for the production of highly stable colloidal solutions, extremely fine suspensions, mixtures and emulsions. “Wet” grinding technique is used, as the rotor and stator cone gap is wider at the inlet and narrower at the outlet. Additionally, the complex micro relief of the stator surface creates increased turbulence, shearing the particles.Under the influence of centrifugal force and high velocity of the rotor relative to the stator, liquid and semi-liquid substances are finely dispersed and homogenized, any mix of materials are also emulsified, homogenized and dispersed. The CLM-4 industrial mixer allows for simultaneous dispersion and homogenization. Heating jacket allows to heat or to cool the crushing zone as required. The CLM-4 industrial mixer features high production rate; it allows to produce highly stable emulsions as well as colloid suspensions, and ensures high degree of homogenization with particle size down to 1 micron. road-construction industry, for bitumen modification by polymers etc, for producing anionic and cationic bitumen emulsions, liquid rubber and so on. * – Dimensions are driven assembly. ** – If necessary, the product can be either heated or cooled to a desired temperature. *** – Depending on the physical and chemical characteristics of the product capacity may vary. Warranty period is 12 months from the moment of commissioning. Equipment can be delivered to anywhere in the world.